Palin says an Obama comment was reckless. (CNN) - Sarah Palin said Friday several of Barack Obama's comments about the conflicts in Iraq and Afghanistan have been "reckless" and disqualify the Illinois senator for consideration as the next commander-in-chief. The comments are among the Alaska governor's most pointed to date regarding the Democratic presidential candidate's readiness to serve and come one day after she aggressively jousted with Democratic VP nominee Joe Biden. "Some of his comments that he has made about the war…I think, in my world, disqualifies someone from consideration as the next commander-in-chief," Palin told Fox News Friday. "Some of the comments he's made about Afghanistan, what we are doing there, supposedly just air-raiding villages and killing civilians - that's reckless." Palin was referring to an answer Barack Obama gave at a August 2007 town hall meeting with New Hampshire voters, during which the Illinois senator was asked whether he had plans to shift U.S. troops out of Iraq to other terrorist hotspots like Afghanistan. "We've got to get the job done there and that requires us to have enough troops so that we're not just air-raiding villages and killing civilians, which is causing enormous pressure over there," Obama said of the U.S.'s mission in Afghanistan. Those comments were immediately seized by GOP critics. The Republican National Committee sent out a press release shortly after calling them "offensive," and demanding he apologize. The McCain campaign has also highlighted the comments several times this campaign season. An AP Fact Check later reported Western forces had been killing civilians at a higher rate than insurgents. Palin also commented Friday on her widely-panned series of interviews with Katie Couric, telling Fox interviewer she did not think the CBS News anchor asked enough issue-based questions. “I did feel there were a lot of things she was missing in terms of an opportunity to ask what a VP candidate stands for, what the values are that are represented in our ticket," Palin said. "I guess I have to apologize for being a bit annoyed, but that’s also an indication about being outside that Washington elite, outside that media elite also, and just wanting to talk to Americans without the filter and let them know what we stand for." In two separate and lengthy interviews with Couric over the last week, Palin seemed to struggle with a number of answers, including a defense of McCain's record on regulation issues. She also appeared to stumble when relating her views on the financial bailout, her foreign policy credentials, her preferred news sources of news, and a Supreme Court case she disagrees with. 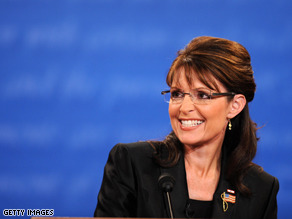 "Man, no matter what you say you are gonna get clobbered," Palin told Fox about her heavily-scrutinized performance. "You choose to answer you are going to get clobbered on the answer. If you choose to pivot and try to go onto another subject that you believe Americans want to hear about, you get clobbered for that too." This woman is really starting to be annoying! Not only her screechy voice, but her self-righteous, know-it-all attitude, which just basically shows she is desperatley trying to disguise how inept she is. America, please don't let her or McCain near the white house!! She was wonderful in the debate. Awwww please.....I am voting for Barack just because I do not want to hear her 3rd grade answers again! She survived the debate which she and her about 20 advisors crammed for. Now how's about we go on to Meet the Press or any other intelligent interviews? And Sean Hannity or the other dunces at Fox News don't count! Just because she isn't an elitest, East Coast snob does not mean she is stupid folks. Personally, I am sick and tired of this bunch of idiots on the "hill" telling the rest of American what we need. Obama is by far the worst snobby, smirking, "I'm better than you" elitest of them all. I would rather vote for a team that knows what I experience than that lying, South Chicago, Daley-Machine robot Obama. Because he doesn't have a clue. And not knowing what I vp does, or not thinking much about a war that had gone on for years (Iraq) doesn't automatically disqualify her? This is the same woman who would use her "power as vice president" over the senate. Yes the vp is the president of the senate and acts as a tie breaking vote, but I think she missed the boat about the checks and balances and seperations of our three branches. As for Obama raising taxes the has constantly been proven as misleading, maybe her campaign should look at the fact that ECONOMISTS feel the Obama camp is offering the better economic plan. Sarah should go home and keep a sharp eye out for Putin flying over. Silly Sarah might be qualified as a writer for Saturday Night Live but, anything else, no way! What he did was speak the truth...Sarah Palin obviously cannot handle the truth. This women showed me last night althought she is very "folky" that I want to have a VP twhoknows more than what she was taught in a few weeks. I do not understand the people that will vote for McCain because Sarah Palin is a mom and is nice!!! This is our Country we are talking about!! We need someone who knows the law, someone who can comprehend any situation that comes up and not act impulsively as we have seen McCain do. We need Joe Biden helping President Obama. This individual is not prepared to be the next vice-president of the United States. Period. Biden did an excellent job last night and to the intelligent Americans, he showed the alarming disparities in the Obama/Biden vs. McCain/Palin philosophies. I am afraid for America if McCain gets into office with a vice-president Palin. Side note: The news media cannot attack Palin either! Why? Because she is a woman and they have already been accused of sexist, biased reporting. Once again the MSM has fallen into the hands of the McCain/Rove camp. Nonethless, HOPE and HELP is on the way! Just who does sarah palin think she is???? Because she managed to string together 2 coherent sentences, she thinks she can bash Obama. Go back home to Alaska, you're NOT WANTED here; and you're definitely NOT WANTED anywhere near the WHITE HOUSE!!!!! Fox News? Ha, Ha, Ha, Ha, Ha, Ha, Ha. Who cares. They have given up even trying to hide that they are in the tank for any and all things Repulican. I have noticed alot lately that when talking about McCain or the Repub Party they use the word "we" instead of they. Also what the heck was that USA! USA!USA! chant started by Palin at the after debate rally? Reminded me of something at a hockey game. I would like to know when are McCain and Palin going to release their taxes for the last 10 years?